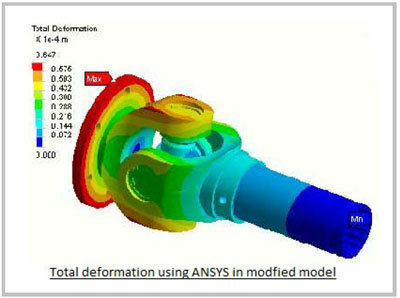 An assembly of the parts was created using CAD tools and the assembled model was imported to ANSYS for analysis. The analysis was done using different boundary conditions. 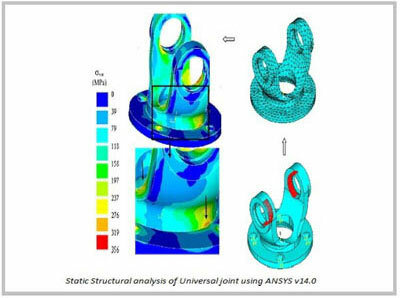 The stress, strain and deformation on the finite element model of the universal joint were measured for varying loading conditions. Universal joints are to be designed to withstand angular loads in order to efficiently transmit the drive shaft power to the differential. It is critical to also consider the variation in loads resulting due to uneven road conditions. Failing to design the joint without considering these factors may lead to premature fatigue fracture and ultimately fail the entire joint assembly. A leading special vehicle manufacturer needed assistance from Hi-tech to evaluate the universal joint design for structural integrity, in order to predict stress concentration regions that may lead to fracture. The universal joint geometry was developed through CAD modeling and structural analysis was performed, considering the actual loading conditions. The analysis revealed that the maximum stress was occurring at both the yokes of universal joint at the middle span. A modification of the design, by a slight increase in dimension was suggested after analyzing the parameters for different boundary conditions. The finite element analysis revealed the exact location where the maximum stress and the maximum deformation were occurring in the part.